The Gboard is essentially a standard numeric keypad that connects to your PC via USB. The specially labeled keys are programmed with macros that correspond to Gmail's keyboard shortcuts. So, rather than having to remember that # moves an e-mail to the trash and e archives the current conversation, you can simply hit one of the 19 clearly labeled keys on this keypad. I've now been using the Gboard for a little more than one full day, and it certainly works as advertised. 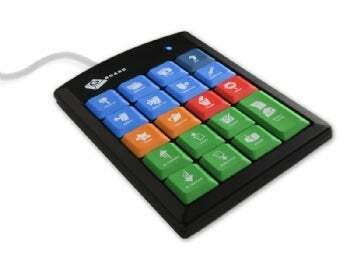 Once you get a feel for the placement of each key, it's easy to operate the keypad by touch. Within a couple of hours, I hardly had to look away from my screen to tap the correct key. It works with both Windows PCs and Macs. There's not much more to say about the functionality of this simple device. What remains to explore, though, is the actual utility of the Gboard. Priced at $19.99, the Gboard does little more than duplicate existing Gmail features that anyone can already use. Its 19 keys offer only about a quarter of the 69 Gmail shortcuts that exist, which means you still have to switch between either the Gboard and your regular keyboard or the Gboard and your mouse to navigate in Gmail. This constant switching between input devices gets annoying fast. For serious Gmail users who don't mind actually learning the hotkeys, the Gboard is not much of a time saver. It is, however, a desk hog. It occupies about 33 square inches of desk real estate, and strings one more cable across your work surface. And it's nearly an inch thick, so you're not going to want to throw it in your travel bag when you're on the road. Unless you're just looking for a fun stocking stuffer or a White Elephant gift to bring to a holiday party, the Gboard probably isn't a great tech investment. But the idea behind it is still worthwhile. It would probably be more compelling if it were a full-size standard keyboard that included labels for Gmail's shortcuts on all the right keys. Last year, Google actually offered free Gmail keyboard stickers that let you label your own keyboard this way. But since that offer is long gone, maybe the folks at Gboard should fill that gap. To get more out of Gmail and other Google services, check out Zack Stern's useful tips for Gmail, Google Maps, and Google Search and Gina Trapani's Get Organized in Gmail.